When we disagree, the sources of our disagreement can often be differing assumptions that are outside our mutual awareness. Working out these differences is a lot easier when we know what they are, but sometimes surfacing the assumptions can be risky. Here's part two of a method based on the Johari window. See "Assumptions and the Johari Window: I," Point Lookout for September 27, 2006, for Part I, where we discussed Open and Blind assumptions. 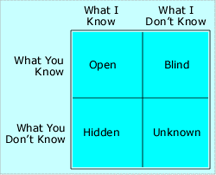 The last two quadrants of the Johari Window are Hidden and Unknown. Hidden assumptions are those that I know I'm making, but you don't. For instance, I might believe that you'll benefit from a particular organizational decision, and that's why you're advocating for that decision. Even though I might be mistaken, I might still make the assumption — and conceal it. Sometimes exposing a hidden assumption is easy, and exposure can lead to relief in the group, as when the assumer doesn't realize that nobody else knows about the assumption. And sometimes exposing hidden assumptions is difficult, because the assumer might actively hide them. When asked, the assumer might actually deny hiding anything. Even upon admitting making the assumption, assumers can feel "caught," and might experience guilt or shame. Defensiveness can follow. One approach to resolution is to first ensure safety, and then search for hidden assumptions by simply asking for disclosure. Often this exposes the accidentally hidden assumptions with relatively low risk. Use the same method for intentionally hidden assumptions, but wait until the second or third pass, after people are more comfortable with the process, and after you've built some success with the easier types of out-of-awareness assumptions. with the easier onesare those that I don't know I'm making, and you don't know about them either. Such assumptions are like land mines whose locations are long forgotten. They're the most difficult to surface, because we're both unaware they exist. And when we do find one, the discovery can trigger strong feelings for us both. Joint exploration for unknown assumptions can be risky, because either or both of the explorers can be caught making assumptions they don't know about. The surprise itself can be unsettling. To ease the surprise, save this pane of the Johari window for last, when experience with uncovering assumptions in the other panes can be a resource for both parties. And be sure that everyone is rested — take breaks, or split the session if necessary. Would you like to see your comments posted here? rbrenRlVNObFyQXmRXmkener@ChacPfNfbMeEgGznnZfYoCanyon.comSend me your comments by email, or by Web form. I offer email and telephone coaching at both corporate and individual rates. Contact Rick for details at rbreneHHSZBbpvpzdgsSbner@ChacIBJhxhNaGmbENCNhoCanyon.com or (650) 787-6475, or toll-free in the continental US at (866) 378-5470.